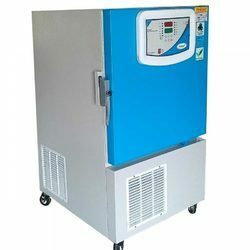 Exporter of a wide range of products which include laboratory pharmacy refrigerators, lab refrigerator, double glass door refrigerator, glass door refrigerator, laboratory refrigerator and three glass door refrigerator. 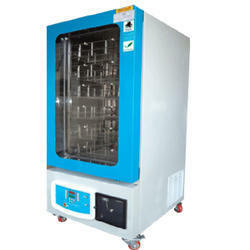 We are engaged in offering Laboratory Pharmacy Refrigerators with 7.0 cubic feet counter height and capacity of 200 liter. Offered refrigerators are widely accepted by our clients as they provide maximum storage space for vaccines, reagents, and other critical samples. Proper cooling, sturdy construction, and long life are some key features of these products. Our clients can avail these supreme functionality refrigerators at industry leading prices. We are engaged in making available Lab Refrigerator, which is provided in 100 liters capacity and 3.5 cubic feet counter height. These refrigerators have easy-to-read controller features, an upward angled LED display and keypad. We manufacture these products in compliance with industrial standards and norms in order to maintain the desired quality standards. Our clients can avail these products at industry leading rates. 2 Years warranty on labour and spares. 5 years warranty on compressor spares. Temperature range from 1 °C to 10 °C with micro controller based temperature controller includes digital temperature display of set value and process value. 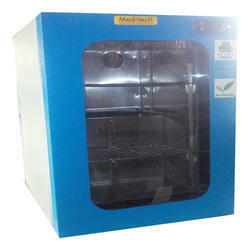 We are engaged in offering Laboratory Refrigerator with 7.0 cubic feet counter height and capacity of 200 liter. Offered refrigerators are widely accepted by our clients as they provide maximum storage space for vaccines, reagents, and other critical samples. Proper cooling, sturdy construction, and long life are some key features of these products. Our clients can avail these supreme functionality refrigerators at industry leading prices. micro controller based temperature controller includes digital Dual temperature display of Refrigerator and Freezer temp. 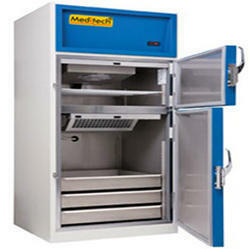 The cabinet of Meditech Lab refrigerators is insulated with high density CFC free Poly Urethane Foam 100 mm thick insulation. Interior chamber is finished resistant stainless Steel (304, 0.8 mm thick). We are well known for presenting Benchtop Laboratory Refrigerator with 50 liters capacity and 1.7 cubic feet counter height. We manufacture these refrigerators using quality materials so as to fulfill the various quality and performance requirements of our valuable clients. These products are widely applauded in the industry for providing optimum temperature uniformity, reliability, and eco-friendly construction for safe storage. 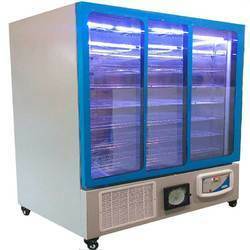 We are engaged in offering of Laboratory Refrigerators for Pharmacy. Our clients can avail these supreme functionality refrigerators at industry leading prices. These Refrigerators are easy to control and operate.